Signature Technologies is a manufacturer of several lines of specialized force transducers specifically designed to monitor the force profiles of punches and forming tools. The "CSL" series is a sealed compression column type load cell with a tool steel load bearing element, and a stainless steel cover. 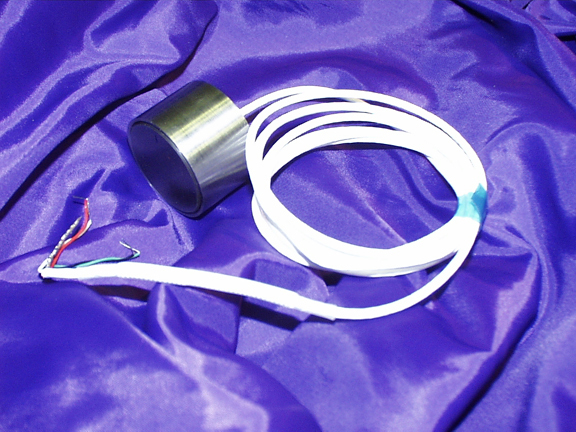 The "CSL" cells are unidirectional load cells used for compression applications only. The cable exits the cells axially in the center of the body, and can be bored through the backup details, and run out through slots in their back surface. The Signature Technologies "CSL" series cells are unique in that they have extremely high overload capabilities compared to the normal load cell offerings by instrumentation companies. The "CSL" is designed for in-die usage where 200 and 300% overloads are common and loads to 900% need to be tolerated. The following table gives the bore sizes "B", locating pin position "A", and rated load for the "CSL" load cell family. Rated loads are conservative and can be exceeded comfortably by 300% without probable cell damage up to 900%. The common way of using the cells is direct placement behind a punch, which has a diameter the same size or smaller than the load cell as shown below. When the load cell is used this way, there can be a bit of "float" in the mounting. However, mounting the cell with a bit of punch end clearance yields a compression only measurement. If some measurement of withdrawal forces is required, then the cell has to be pre-loaded against the end of the subject punch - generally by using shims. This has to be a very precise setup since 1 or two tenths of compression is all that is needed. 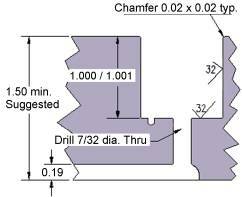 The likelihood is that the cell, the counter-bore, and the shim(s) will have to stay as a set in order to maintain the adjustment. When using the Signature Technologies "CSL" series load cells in conjunction with instrumentation from other sources, the relatively low signal output of the cells must be taken into consideration. Typically the signal output will be in the 0.3 millivolt per volt of excitation at rated load.